Overall, the book is a great compliment to the other books I’ve read on nutrition. It doesn’t introduce any radically new concepts. It reinforces healthy eating habits starting with natural foods rather than high carbohydrate, processed foods. As with other modern nutritional books, it calls for a reduction of breads, grains and dairy in our diets. What makes It Starts With Food different, and perhaps more accessible to a wider audience, is that the concepts are presented from a lifestyle perspective rather than a science or medical method. I also liked the inclusion of the “Meal Map” as an appendix. Other books are heavy on why diet is important but light on how to implement it. The “Meal Map” bridges that gap and provides easy to make practical recipes. There’s also a second appendix with more resources such as recommended cookbooks, recipe sites, finding good food, websites, books, and movies. One of my outstanding actions after reading the book is to incorporate the “Meal Map” into my regular rotation of meals. The only thing about the book that turned me off were the intro stories to each chapter. They are extreme cases where adopting a new, healthier diet cured one’s medical condition. I understand the need to do some self-promotion to show how changing one’s diet can improve one’s health. And while I don’t doubt the veracity of the stories, I’m not convinced that changing the diet is the cure to what ails everyone. Sure, it can only help, but we should be careful over promising the affects of a natural diet. Anyway, this is not a major issue. Just something to keep in mind when you read the book. 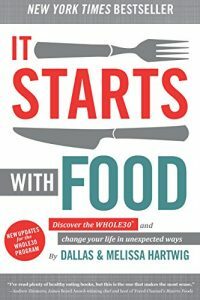 It Starts With Food is a Must Read in my mind purely for the health and nutrition information it provides. I put it right up there with Wheat Belly and Grain Brain. If you’re serious about making a change in your health, it starts with what you are putting in your body. As they point out in the book, everything you eat either has a positive or negative affect on your health – “there is no food neutral; there is no food Switzerland.” In other words, it starts with food. The book will reinforce what you already know and keep you on the right track to improving your health.